Global Mobile Infrastructure and Mobile Broadband - Mobile maturity differs around the world | Market Research Reports® Inc. Global Mobile Infrastructure and Mobile Broadband - Mobile maturity differs around the world report is published on August 15, 2018 and has 146 pages in it. 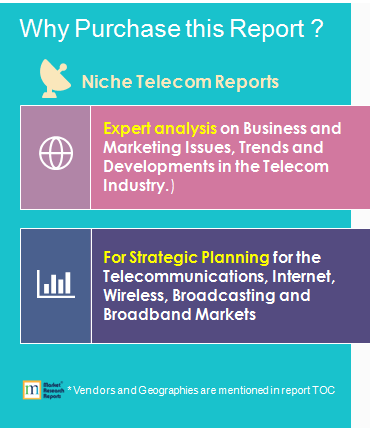 This market research report provides information about Telecom, Broadband, Telecom Infrastructure & Networks industry. It covers Global regional market data and forecasts. It is priced starting at USD 1,590.00 for Single User License (PDF) which allows one person to use this report. The global mobile industry is a continuously evolving sector which plays a huge part in the economic and social progress of most countries. However there are enormous variances around the world in terms of telecoms and mobile market maturity. With the emerging 5G on the horizon, it is the countries with more mature markets which are well placed to take advantage of the opportunities presented by the new technologies. This report provides valuable information, analyses and statistics on the global mobile industry including mobile broadband. It also provides regional mobile market overviews and incorporates BuddeComm’s Telecoms Maturity Index which measures and ranks the maturity of a country’s telecoms industry on a scale of 1 to 100. Comparison of the maturity of telecom markets around the world using BuddeComm’s unique “Telecoms Maturity Index” (TMI) for Africa; Asia; Europe; Latin America and The Middle East. Many regions around the world offer a diverse range of maturity when considering the telecoms industry, with some markets having a high level of mobile penetration but low level of fixed broadband infrastructure and others comprising both. Across the board however; the demand for data services just continues to rise with governments and operators investing heavily in installing and upgrading infrastructure to maintain and expand networks. Substantial investments in LTE technology have occurred in most parts of the world and many countries are now gearing up for the potential opportunities offered by the highly anticipated 5G technology. Asia is one example of a diverse region with regards to its telecoms industry. It contains a vast array of countries, ranging from those with highly mature and advanced telecommunications markets, that are world leaders in the move towards 5G, such as South Korea, Hong Kong, Singapore and Japan, to some of the poorest and least developed countries such as North Korea and Afghanistan. Africa also has one of the more diverse mobile markets, with a large number of operators providing voice and data services. The different levels of market development have characterised the mix, with commercially launched LTE services particularly strong in a number of countries such as South Africa, Uganda, Nigeria and Kenya, and yet still absent in some countries, particularly those with low incomes or with poorly functioning economies. Similarly with mobile data use, there is a close relationship between data take-up and consumption and the condition and extent of fixed-line networks. There remain some significant differences in maturity within Europe as well. In general terms, the Scandinavian and northern European countries tend to have a higher telecom maturity, followed by those of southern Europe and then those within eastern Europe. Those in eastern Europe were long-hampered by underinvestment during decades under Communist rule. The gaps between these regions are closing however. Globally, the mobile markets continue to offer huge potential for growth in mobile data, on the back of the sheer volume of mobile services on offer. The rapid take-up has been underpinned by increasingly cheaper smartphone prices and lower airtime tariffs leading to even wider adoption. The next wave for smart phone growth will also involve advancements made with 5G technology and demand for 5G capable devices. The telecoms industry is poised for further transformation with the highly anticipated 5G technology on the horizon. It has attracted intense interest from the ICT industry and wider community due to its potential to increase opportunities for developments related to IoT including M2M communications, virtual reality, Artificial Intelligence and mission critical communication. It is also expected to enhance overall capacity, speed and latency of the mobile networks. In 2018 there has become an obvious “race to market” competition around the world with operators and governments all wanting to be the first to capture the opportunities presented by the 5G evolution. In particular, a number of countries in the Middle East are demonstrating significant 5G progress. In the meantime, 4G LTE deployments and upgrades will remain a key infrastructure priority and we will see continuing mobile broadband growth around the world. Mobile broadband penetration is fast approaching 100% in the lucrative developed markets while the developing markets offer significant opportunities for growth with mobile broadband penetration reaching around a 50% rate. This BuddeComm annual publication provides valuable information on the diverse worldwide mobile markets. It includes analysis of important global trends supported by industry statistics relating to technologies; subscribers; revenue and mobile devices. It provides information and statistics relating to 4G LTE as well as the emerging 5G technology. Regionally there is much diversification when comparing the telecoms markets globally. This report includes an overview of the mobile markets in the major regions around the world. It also incorporates BuddeComm’s Telecoms Maturity Index which measures and ranks the maturity of a country’s telecoms industry on a scale of 1 to 100. All countries are placed into one of three categories: Market Leaders, Market Challengers and Market Laggards, according to their Market Index score. Comparisons are also made between the mobile broadband and fixed broadband penetration of the various countries which comprise the regions of Africa; Asia; Europe; Latin America and The Middle East. 3.8.1 What makes 5G special?